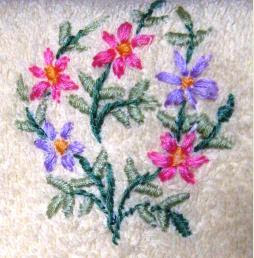 Embroidery on a face towel : I tried to get artisitc by embroidering the face towels I had in my closet. I know, the texture of the towel isn't good enough to hand embroider. But still I tried and learnt some lessons in the process. I hope the next one comes out better. Here is the picture of what I did. I cant say that I absolutely love it, but its not bad either, isn't it??!! Thankyou Asha and Roopa for those encouraging words. Nodbeku, for how long I will be able to continue antha.